A suspect charged in the January murder of a Pahrump man waived a preliminary hearing in the case last week and was bound over to District Court to answer to charges there. The move may signal a plea deal is close in the case. Peter Helfrich and his attorney waived the Justice Court hearing and are scheduled to appear in the higher court early next week. Helfrich was initially charged in the case with one count each of first-degree murder and destroying/concealing evidence after he allegedly admitted to police that he killed his neighbor, Salvador Gama, on Jan. 23 after striking him twice in the head with a baseball bat. The man went on to tell officers on Jan. 23 he and Gama had been drinking for several hours when Gama allegedly said there was a “hit” out on Helfrich’s life and that he was going to kill him for money. Helfrich told police Gama allegedly picked up his hunting knife and began chasing him around his desert trailer located in the 2900 block of E. Adkisson Road. According to an arrest report in the case, Helfrich told a detective he tried the stop the man first by spraying him in the face with bug spray and then pepper spray. When that allegedly didn’t stop Gama, Helfrich said he picked up a cross bow and tried shooting his neighbor in the chest. The cross bow apparently didn’t work either — Helfrich told detectives the arrow ricocheted off the man’s chest. After trying three times to stop Gama, Helfrich said he finally picked up a metal baseball bat and struck the man twice in the side of the head, causing him to fall to the ground. When Helfrich’s girlfriend and co-defendant Sylvia Castillo returned home later that day, she allegedly helped him dispose of Gama’s body off Wheeler Pass Road in Clark County before burning some of the evidence at the scene. 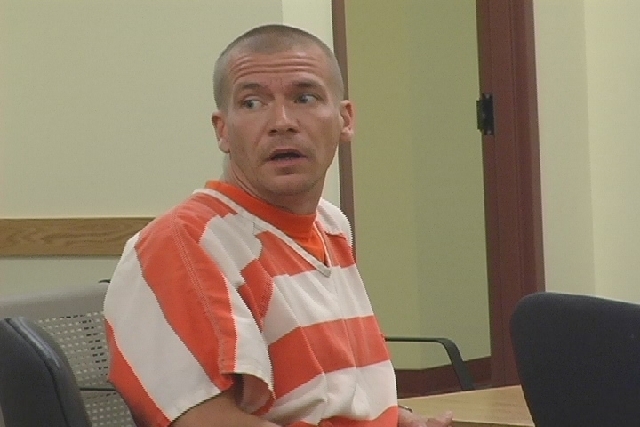 During one of his initial court appearances in the case, Helfrich and his attorney asked Justice of the Peace Ron Kent to conditionally bind Helfrich over to the District Court in order to send him to Lake’s Crossing, a state mental health facility in Sparks, for a mental competency evaluation after he said he suffered from a long history of mental health issues. In May, Helfrich was returned to the court after staff at the facility had deemed him competent to stand trial in the case. He was sent back down to the Justice Court level for a preliminary hearing in the matter. After the waiver of a preliminary hearing was filed last week, however, Helfrich was again sent back up to the District Court. He is scheduled to appear in the higher court on Aug. 26. His attorney declined to comment for this report.